Buy a Segway the ULTIMATE TOY - BuyOldToys.com!! 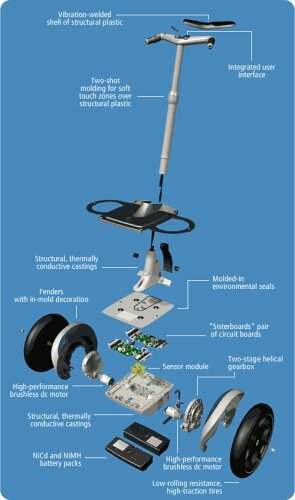 Balance Sensor Assembly (BSA) The BSA, supplied by Silicon Sensing Systems, is an elegantly designed, extremely robust, and yet incredibly sensitive piece of equipment. This small cube, 3 inches on a side, is packed with five solid-state, vibrating-ring, angular-rate sensors ("gyroscopes") that use the Coriolis effect to measure rotation speed. These tiny rings are electromechanically vibrated in such a way that when they are rotated, a small force is generated that can be detected in the internal electronics of the sensor. Each "gyro" is placed at a unique angle that allows it to measure multiple directions. Segway's onboard computers constantly compare the data from all five gyros to determine if any of the five is supplying faulty data--in this condition, it can compensate and use data from the remaining sensors to continue balancing through a controlled safety shutdown. Two tilt sensors filled with an electrolyte fluid provide a gravity reference in the same way your inner ear does for your own sense of balance. The BSA is monitored by two independent microprocessors and is split into two independent halves for redundancy. Even the communication between sides is performed optically to avoid electrical faults on one side propagating to the other. Motor The Segway HT's motors are unique in a number of respects. Produced by Pacific Scientific, a division of Danaher, they are the highest-power motors for their size and weight ever put into mass production. Each motor is capable of maintaining a power output of 1.5 kilowatts--that's 2 horsepower! The motors use brushless servo technology, meaning there are no contacts to wear, arc, and reduce performance. The magnets are constructed of an incredibly powerful rare-earth material: neodymium-iron-boron. Each motor is constructed with two independent sets of windings, each driven by a separate board and motor. Under normal conditions, both sets of windings work in parallel, sharing the load. In the event of a failure, the motor is designed to instantly disable the faulty side and use the remaining winding to maintain control of the Segway HT until it can be brought to a stop. The motor is carefully balanced to operate up to 8,000 rpm, allowing it to produce very high power levels in a small package. Feedback from the motor back to the Segway HT is provided by redundant, noncontact analog hall sensors that sense the positions of magnets with no moving parts other than the motor shaft itself. The Segway HT's gearbox, a joint effort between Axicon Technologies and Segway, is constructed more like a precision Swiss watch than a traditional gear drive from an automobile. A two-stage reduction system provides a 24:1 reduction, allowing the motor to operate at powerful, efficient speeds throughout the full range of speeds of the Segway HT. Each gear is cut to a helical profile, which creates a spiral engagement to minimize noise and increase the load capability of the gears. The number of teeth on each gear is chosen to produce noninteger gear ratios. This means that the teeth will mesh in a different location each revolution, maximizing the life of the gearbox. Engineers were so obsessed with the details on the Segway HT that they designed the meshes in the gearbox to produce sound exactly two musical octaves apart--when the Segway HT moves, it makes music, not noise. The gearbox is pre-assembled and lubricated, and is designed to require no maintenance over the life of the Segway HT. It has been tested for thousands of miles under severe conditions. Wheel and Tire Michelin was one of the earliest partners in the Segway HT design project. The tires on the Segway HT have been designed specifically for this product, using a unique tread compound (a silica-based compound instead of traditional carbon-based materials), giving enhanced traction and minimized marking on indoor floors, and a specially engineered tubeless construction that allows low pressure for comfort and traction while minimizing rolling resistance for long range. The tire is mounted on an equally unique wheel design: the wheel is constructed of a sophisticated engineering-grade thermoplastic chosen in partnership with GE Plastics. This composite material allows light weight and excellent durability, and actually reduces noise transmitted from the drive system. The wheel is molded around a forged steel hub, eliminating fasteners that can loosen over time. The attachment between this hub and the transmissions incorporates a unique (patent pending) taper and hex design, which allows a single nut to attach or remove the wheel while retaining the security of multiple-bolt systems more typically seen in conventional applications. Batteries The Segway HT uses twin NiMH battery packs, designed in partnership with SAFT (a division of Alcatel), running at a nominal 72 volts. These nickel-metal hydride cells deliver the highest power of any currently available chemistry, optimized to maintain the Segway HT's balance under severe conditions. These are not your cell phone batteries! Each pack consists of an array of high-capacity cells and a custom-designed circuit board that constantly monitors the temperature and voltage of the pack in multiple locations. This assembly is enclosed in another unique application of GE thermoplastics--the battery box is sealed using a vibration welding technique that makes the outside of the pack a single, continuous structure--sealed from moisture and strong enough to survive the most extreme tests our durability engineers could throw at it. The internal electronics in the battery incorporate "smart" charging--the customer need only plug the Segway HT into the wall and the battery will choose the appropriate charge rate based on temperature, voltage, and level of charge. The batteries will quick charge, then automatically transition into a balance and maintenance charge mode. The Segway HT customer does not need to worry about memory or timing their charges--just plug it in. Under normal operation, the Segway HT carefully monitors both batteries and automatically adjusts to drain the batteries evenly. In the unlikely event of a battery failure, the system is designed to use the second battery to operate the machine and allow it to continue balancing until it is brought to a safe stop. Controller Boards Two sophisticated controller boards from Delphi Electronics provide both brains and brawn for the system. Delphi Electronics was chosen as a partner based on their track record in the production of high-volume, high-quality automotive electronics for such demanding applications as airbag modules. Each board contains a Texas Instruments digital signal processor, monitoring the entire Segway HT system and checking 100 times per second for any faults or conditions that might require immediate response. It reads the information from the BSA to determine if the rider is leaning forward or backward, and instantly uses this information to deliver power from the batteries to the motors through a set of 12 high-power, high-voltage field-effect transistors (FETs). These calculations take place 100 times a second, and the motors are adjusted at up to 1,000 times per second, responding far more quickly than the human body is capable of perceiving. Although each board is capable of operating the Segway HT after a failure (each board, in fact, powers electrical circuits on both motors), under normal conditions they share the load. Inventors' Note The dictionary defines segue as "a smooth transition from one place or idea to another." While the Segway HT represents a smooth transition from one physical place to another, we chose the name Segway for our company because we believe the Segway HT also represents an important transition to a new idea: an energy efficient, environmentally friendly, productivity enhancing, and fun alternative for short distance travel. Segway enthusiasts who choose to purchase the first Segway Human Transporters through this program will have the world watching them. Hopefully, you will represent Segway with the same passion and vision we had in bringing the idea to reality. Why such great expectations? Because we believe that when you are among the first to purchase and embrace new technology, you personify the spirit that allows inventions to become innovations, and that spirit can change the world.